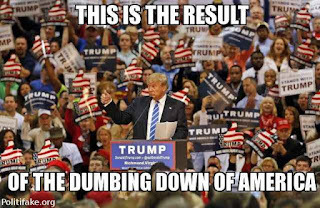 The "dumbing down" of America crept up on us like a panther pouncing on a capitalistic pig with palsy. Sometime, sages know not when, our education system became less of a priority in our money-loving society. In the fifties they taught us cursive in school. Today, if a student can even print legibly, they're doing good. They might even get a Smiley Face sticker from the teacher to show Mom and Dad how clever their child is. The sad truth is our education system is mediocre compared to the rest of the world, according to an international ranking of OECD countries. Last year's comparison of academic performance in 57 countries left America in the middle of the pack at #16. Finland came out top overall. There is a growing and disturbing trend of anti-intellectual elitism in American culture. It’s the dismissal of science, the arts, and humanities and their replacement by entertainment, self-righteousness, ignorance, and deliberate gullibilty (See Donald Trump). Is there hope for a postive change? Perhaps. President Obama signed an education bill last December that substantially limits the federal government's role by barring the Education Department from telling states and local districts how to assess school and teacher performance. That's a step in the right direction, but still doesn't get to the core of our education system's problems. Parents, teachers, and politicians need to prioritize education like never before. What does that mean? Among other things, it means taking a good look at what's happening in our culture. 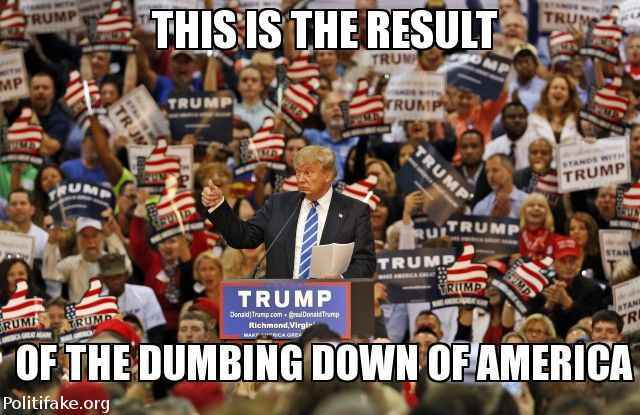 What's causing this delibrate dumbing down of students? It also wouldn't hurt studying Finland's education system to see why they lead the world in smart kids.